Pretty photo frames are also ready-to-paint sun catchers! 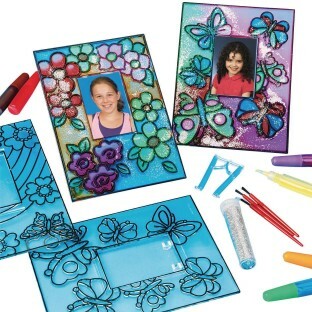 Includes 5" x 6-3/4" frames with 2-3/4" x 1-3/4" photo openings, hangers, stain and brushes. Makes a great gift - perfect for Mother's or Father's Day. THe frames are great but we didn't use the stains and microsocpic brushes. We used regular paint and suncatcher paints with full size brushes as the stuff that came with it was too hard for the girls to use. We had grades K-3 and all were able to do it with real paint. I wish it came as just the frames and didn't include the other stuff! Great looking craft project. Very sturdy and lasts much longer than a fun foam frame or other cheap craft projects. We chose not to use the stains and brushed though because the containers and brushes were tiny. We used suncatcher paint and brushes instead. I did the project with 5-8 year olds and everyone loved them equally! Seniors in our assisted living facility paint these suncatchers and put wallet size photos of children grandchildren in them often give them as gifts to their families. They love doing them and are proud to give away a nicely done project as a gift. Easy to use always turn out nicely room for individual creativity in colors. They love them.